So I guess yesterday morning my daughter and my husband were eating breakfast at the kitchen counter/breakfast bar/thingie, and hubby looked up and noticed something in the ceiling air vent. He pointed it out to my daughter, who surmised it was some kind of mold or dust something growing there. They are so naive. Hubby and I were on our way out to play golf when he pointed it out to me. He said something about something growing in our ducts and he didn't like it. I said, um, it's a tail of a rodent hanging out of our vent. His jaw dropped and he was like, ew, and I said we really need to get that down. But not right now because, duh, we're leaving to play golf. Priorities. I was unaware of the breakfast conversation, so when my daughter came home, I figured I'd freak her out a little. I asked if she wanted to see something really repulsive. Her eyes lit up in that I'm scared but intrigued kind of way teenage girls get. I pointed out the air duct and she said oh, yeah, dad already showed me that this morning. Very nonchalant. I said, oh, don't you know what it is? Well, it's mold or something. No, it's a rodent tail. WHAT!?!?!? OMIGOD!!! Scream, eeewww, scream, eeewww, etc. 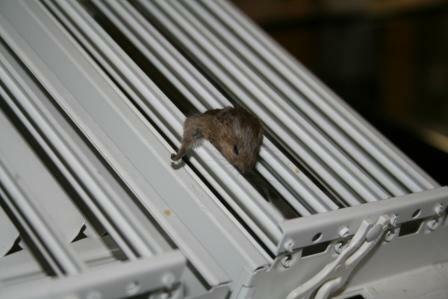 So hubby got the ladder, unscrewed the vent, and rescued us from the tiny deceased mouse. My hero. Except for when I was holding the ladder for him and he went, "OH NO IT FELL ON ME!" and I almost stroked out. Turns out the mousie had only had too much egg nog and was taking a break. We delivered him to the field behind the house. I'm sure he woke up with a terrible hangover, had some coffee, called in sick to work, and now he's fine. Yeah, I'm sure that's what happened. Linda, This brings back memories of the first time I remeber seeing a live mouse run through my kitchen. I was probably 14 or 15, and living with my dad and brother. My dad was at work, and I walked into the kitchen and a mouse ran by. I jumped in the middle of the kitchen table screaming like a banshee, and called my dad at work to come home and do something. The poor mouse had disappeared by then, and I am sure he was way more terrified than I was. I really don't know what I expected my dad to do anyway, but I remember almost refusing to get off the table until he got home.They still make me flinch pretty bad, but I can manage to keep the screaming at a minimum. Nevermind the mouse! 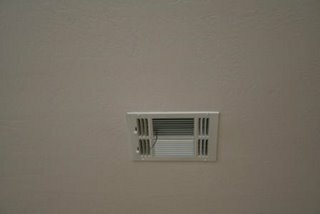 Whose vents are THAT squeaky CLEAN? di - it's amazing how such a small thing can evoke such a strong reaction in someone who is generally a rational person! jennine - well, maybe they WERE clean, until Mr. Mouse got in there! Hey, I have been reading your blog, but it's not allowing me to post comments. Is this because of the beta thing of which Jeff speaks? That's hysterical! I needed a good laugh about now! I can just see Jess screaming and carrying on! Yeah...that vent looked pretty darn clean to me too! How did the mouse get between the walls? Is there a hole outside? Do you live in rattle-snake country? Thought I would make your day! dorothy - for some reason, our vents don't get very dirty. It's a good thing, too, because I am really busy not cleaning the rest of the house. bill - beats me how he got there. Maybe he's The Great Mouse Detective. Between him and the snake, I'd choose him! I don't mind mice too much - but my wife freaks out about them. I'm pretty sure she'd want to sell the house if she ever saw that sticking out of one of our vents! h-man - Mice don't really scare me, but if I wanted one, I'd go to Petco and buy one. And a CAGE!